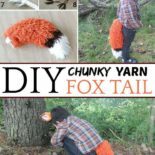 Find out how to make this adorable chunky fox tail with yarn! 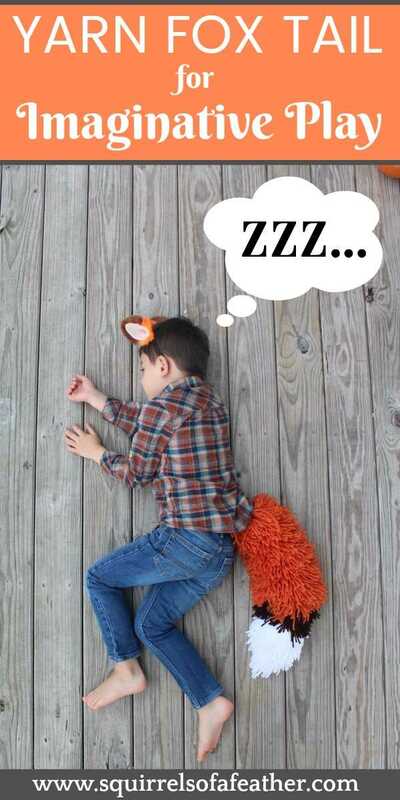 This DIY fox tail costume tutorial is easy to make and great for costumes or imaginative play! It’s also a great idea for a DIY Halloween fox costume. In regards to the color of the tail, you can choose to do the yarn only in orange and white, but I liked the added depth and dimension the brown strip added to the tail. **Pro-tip about buying yarn – I suggest making or purchasing your fox ears BEFORE buying the yarn. That way, you can take the ears to the yarn store or compare online before you purchase. The brown that I used on my tail turned out to be quite a bit darker than the adorable ears that I bought. I still love both, but in retrospect, I might have chosen a lighter brown for the tail like this one. 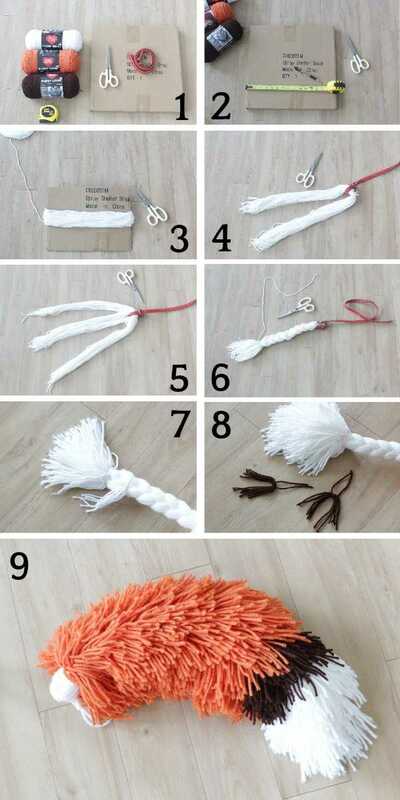 I actually made one of these fox tails YEARS ago, when I saw this cute tutorial on making a wolf tail. At that time I wanted a much chunkier tail for my fox costume, so I changed up things a little bit. This gorgeous yarn fox tail is sure to delight the wearer and if made correctly will last for years, even decades. That being said, this is not a quick one-hour-and-done tail. You are going to need to devote a decent amount of time to this. I created my fox tail over a period of several days, working on it an hour or two at a time. Don’t try and make this as a last minute Halloween costume! Gather all of your items together. Take the measuring tape and measure from the waist to the desired length of your tail. Mine was 14 inches in length. When the tail is completed, you will be attaching it either by using a belt or a carabiner at the waist or pants. You may want to experiment and see how the belt/carabiner sits before you finish measuring. Use the measuring tape to then mark your desired length onto the cardboard box and cut out a wide rectangle that is equal to your length (again, mine was 14 inches). We are going to be wrapping the yard for the tail base around the cardboard. 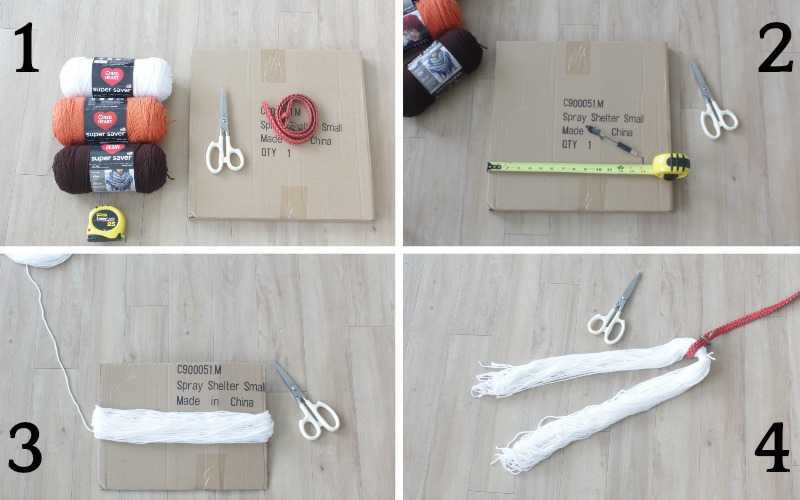 Take the white yarn and begin to wrap it around the cardboard, continuing until you have it wrapped many, many times. You want a tail that is about 1-1.5 inches thick. Make sure you are in this range. If the tail base is too thin, your tail will be thin. If your tail is too thick you will have trouble attaching the yarn pieces later. The bottom of the tail base will become the white part of your tail. You need a Goldilocks tail; not too thick, not too thin, just right! Take one end of the yarn on the cardboard and cut THAT SIDE ONLY. Take the white tail base and immediately use another piece of yard to wrap several times around the top of the tail, tying it off at the middle. This is going to help keep our tail nice and secure, and give an easy access point for the belt or carabiner to slide on. After securing the yarn at the top, attach the tail at the exact middle to the belt or carabiner. Taking the white tail, separate it evenly into three pieces to braid. Make sure to take a portion from both the right and the left evenly to make a middle piece (see pic). Now braid the tail all the way down, leaving some white at the bottom. This will become the very end of your fox tail. This party is the trickiest part and takes the longest. 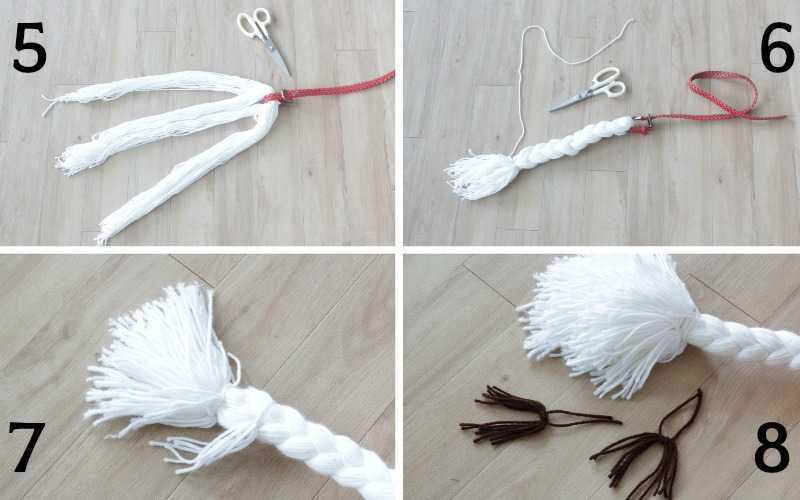 You are going to now take the white yarn and wrap it loosely around your hand 6-7 times. 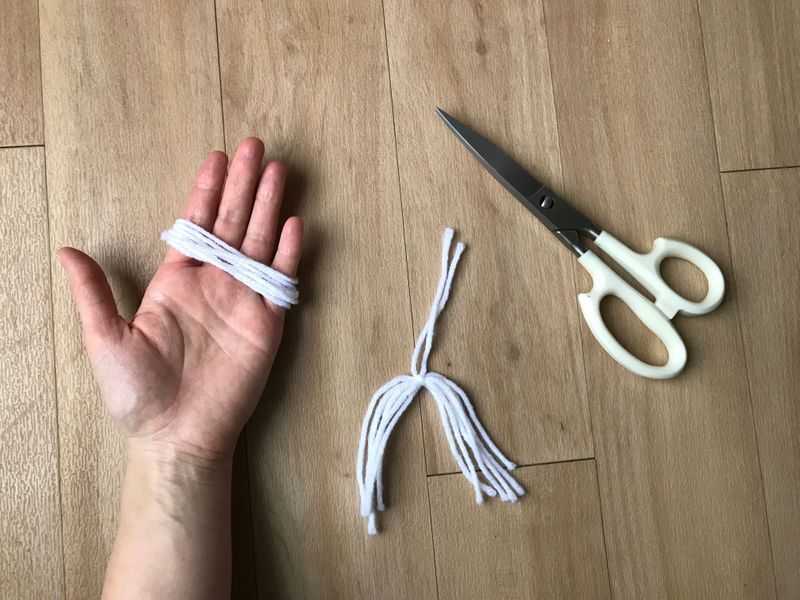 Once you have it wrapped around your hand, cut one end and immediately tie the white strands around the middle in a knot. Make it tight! After tying in a knot, take one strand from each side of the knot and tie it around the fox tail base, making sure to double knot the strands. Continue to do this, rotating around the tail as you go so that the strands fan out evenly around the entire tail to make it nice and plump and bushy. You are going to repeat step 7 until finished. Add a little bit more of the white to the base, then add a layer of brown, finally finishing up with orange all the way up to the top of the tail. When you get to the top of the tail, make sure to leave a little white space so that the orange pieces don’t slip off the end. Now that you are all finished, you can attach your fox tail as desired with the belt or carabiner. Sing “What does the fox say?” as you dance around in glee, enjoying your gorgeous new fox tail! I hope you loved this tutorial! Leave me a comment in the comment section below and let me know how it went, or if you have any questions about the tutorial. 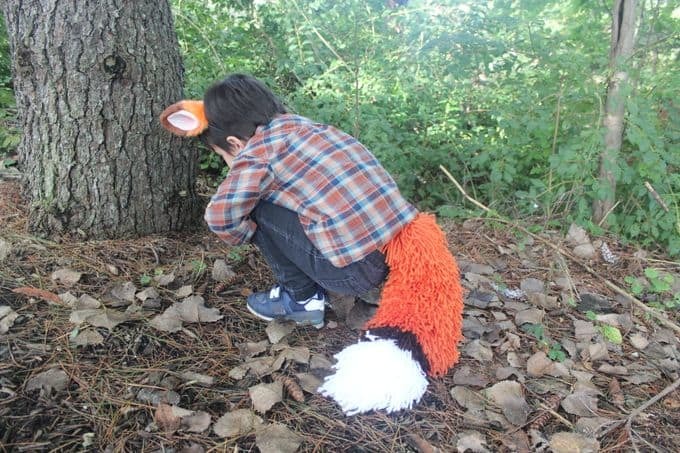 The fox tail is a super cute idea. Love it!! Hahhaha, thanks Julie! I definitely got the Goldilocks tail! This is so cute. My daughter was a wolf the year “What does the fox say” was popular. Everyone asked her if she was a fox and she would reply, no I’m a wolf – lol. Thanks for sharing on To Grandma’s House We Go! Too funny! I don’t even know how long ago that was, but we sure do love our foxes…and we listen to the song ALL THE TIME! See you next week! I love how this fox tail turned out! This is soooo cute and creative. You’re definitely talented with this stuff! I don’t think I’d have the skill to make this lol! Aww! This is SO cute, Marissa! I love homemade costumes and I love when the instructions are so clear, like yours are here! Aw thanks, Carrie. I just love sharing my little foxy with people. Glad you like the instructions!